Though in the pallet wood wall cladding or wrapping we prefer the entire wall to be covered with identical shipping pallet planks, but this time we are going to do something different. 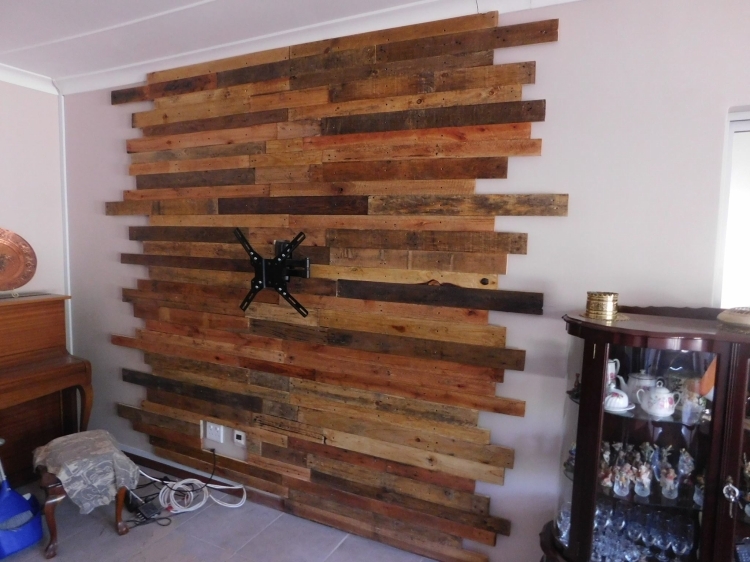 As we know that this pallet wood wall cladding is meant to be done especially for the LCD, so just to make it more prominent we are not going to cover up the entire wall, but we would spare some space on both sides which would even enhance the beauty of pallet wood wall cladding. The supplies again are going to be the same of the shipping pallets. Ok, so we are starting from here. First of all grab a pile of wooden pallets, and dis assemble them with some tools that you carry with you. Just be careful while dis assembling because the broken pallet planks wouldn’t be used in the wall cladding. After you are done with the disassembling, sort out the most identical planks to be pasted along on the wall. 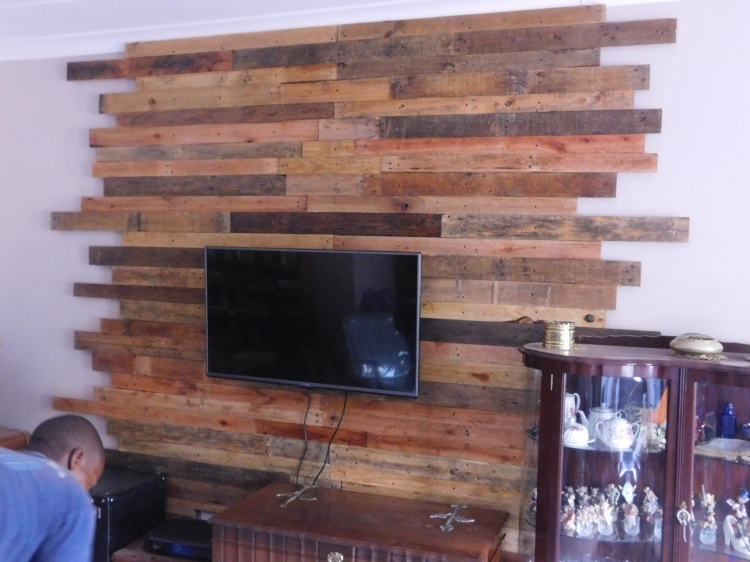 Use the random lengths of pallet wood planks and fix them on the wall with a quality adhesive that is specifically used for wall cladding, lastly fix the LCD bracket right in the middle of the wall cladding. To figure out the middle point, proper measurements should be done because if LCD not fixed properly in the right spot, this would look ugly. So after all the processes, finally we fixed the LCD right in the middle of the wall. The pallet lengths are used randomly, we fixed them with the help of adhesive and nailing as well to ensure the planks remain intact to the wall. 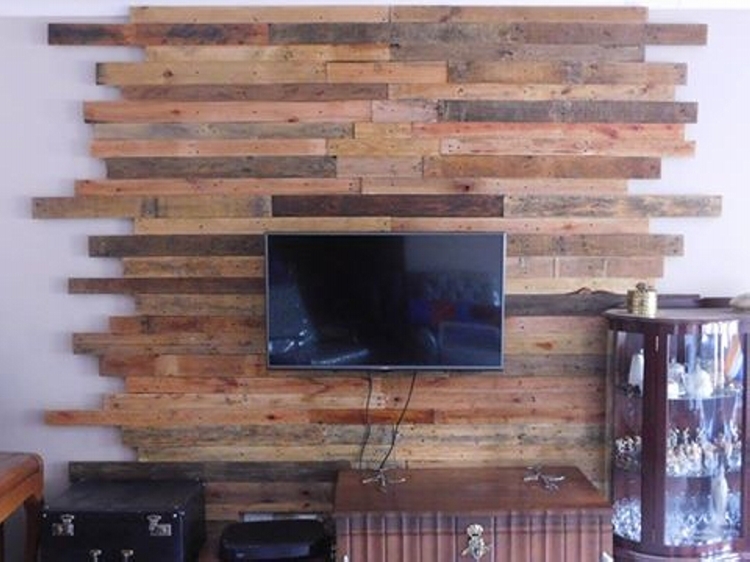 This pallet wood wall cladding which was done purely for the installation of LCD in the middle would look something like this.